In Florida, as in many places, recycling is not mandatory. Many things in life are not financially profitable, however that doesn’t mean they are not the correct thing to do. Recycling typically falls into this category. We have found a way to correct this social issue and others at the same time. 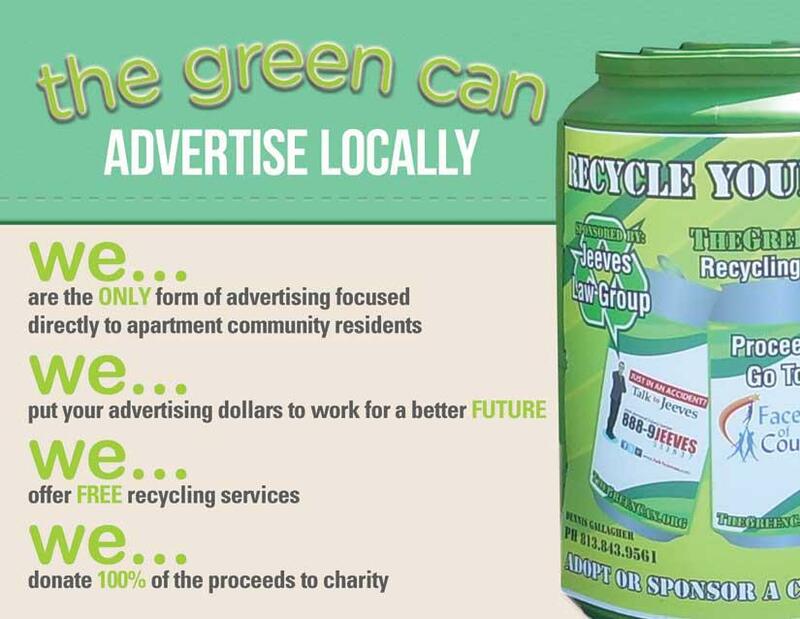 We offer free recycling to apartment / condo complexes and businesses and then donate all of the proceeds to local charities. What finances this philanthropic endeavor is advertising or sponsorship money. Spending your shopping dollars locally is one of the easiest ways you can financially support your own neighborhood and at the same time the environment. The difficulty here is knowing what businesses are options for your needs locally. In an age of DVR’S, junk mail, spam, and decreasing popularity of print newspapers the small business is losing the war for consumer dollars. Trying to actually reach the people nearest the business has become the most difficult and most important issue for a small business. The decline in the economy has impacted almost everyone except the large multinational corporations. Charities have been hard hit by the financial downturn, small businesses are feeling the squeeze and additional expenses for something like recycling is not financially justified. No matter how short sighted, and wasteful, profits are what make the world go around. We have addressed all of these issues with our program. We deliver one of our proprietary containers that is designed specially as a functioning ground level billboard and is made in the USA out of recycled plastic. For free. When it is full we come and change out the 100% reusable liner that is made by hand in the USA and recycle the materials. For free. We then take the full amount of the value of the recycled materials and donate it to a local charity. The Green Can began in Tampa, Florida and started placing containers March 1st 2012. In 6 months we had recycled over 150,000 aluminum cans and several thousand pounds of plastic. We just crossed the 9 month mark and have recycled over 250,000 aluminum cans and countless tons of plastic. We currently serve over 20k households with over 50k residents and we are adding locations weekly. The Green Can is trying to make a positive difference in the world, and we are looking forward to the second step of that journey. If you would like to make a difference and run your own profitable and positive recycling business please contact us. Follow The Green Can On Facebook!